Mushrooms can cause a reptile dysfunction. Or else the Ranger will have to come down, man. "There isn't mushroom in there." "When I said throw them a joint, I meant meat!" It makes them snap at the unicorns. If you find any, give them to the staff. "Quick, pass me that magic mushroom and make it snappy!" They ate Charlie last week because he was a fungi. V-shaped snout, leave it out. U-shaped jaw, FEED SOME MORE.
" Hey, you want some Lysergic Acid DiethylamHIIIDE !!!" Don't waste them on the alligators. Save them for the Crackerdiles. We need to ensure they're absolutely starving by the time Noel Edmunds gets in. It sends them off their crocker. 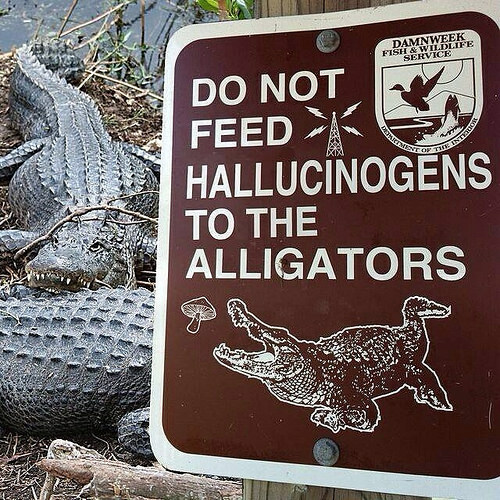 The last time i fed an alligator magic mushrooms, he was a fungi to be with. Very tame. No trips out for these alligators. .... so the struggle for the ‘moral high’ ground commences. They would rather keep their appetite for you. ..they prefer cats (Meow Meow). Only the birds want to get high.